Vanilla Garlic: Another Le Creuset Giveaway! 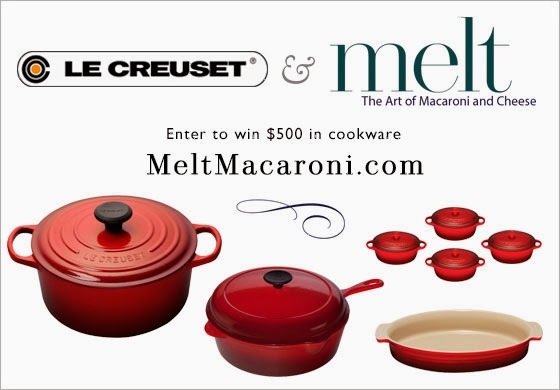 We're giving away another set of Le Creuset! Take a photo of yourself with the Melt cookbook, either your own copy of someone else's, and post it to your Facebook wall with the wording: "I love macaroni and cheese and Le Creuset! http://www.meltmacaroni.com." One winner will be selected and announced on December 15th, 2013. For other details and legal what-have-you, please refer to the official contest rules. Yeah for the new book! I have it on my wish list at Amazon and I can't wait to push GO! I read the recent post on Ree's blog about it too. Congrats! although you'll never see me endorse anything on facebook (so no link or photo to follow), I do wish you all the very best with the new book! Made the green Beechers mac and cheese for dinner tonight. I confess, I l selected it for its color, sort of Halloweenish and all. It was awesome! Really glad you put in the substitutions for cheeses, we out in the hinterlands have limited options. Eager to try more! Hope your tour anxiety has improved.